On Monday 21 March will take place the second edition of the « Goüt de France/Good France » day, a worldwide celebration of French gastronomy and art de vivre. Sponsored by the French Foreign Office, the operation will gather more than 1500 restaurants around the globe. Luckily for us, two of them are in Scotland: La Garrigue, in Edinburgh, and Taste in Cumberlaund. 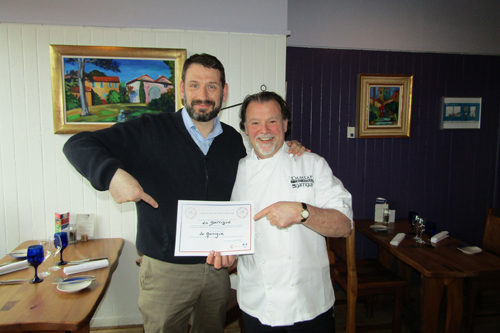 Manager Morgan Miceli and chef Jean-Michel Gauffre proudly posing with their « Goût de France restaurant » certificate. In Edinburgh, La Guarrigue’s renowned chef Jean-Michel Gauffre and manager Morgan Micelil embark you on a culinary trip to the always sunny Languedoc-Roussillon. A special menu is planned for the event, including a « soupe à l’oignon » with Roquefort cheese, and a traditional cassoulet. In a few words, those of Jean-Michel: « Authenticity, conviviality, that’s what our restaurant La Garrigue is all about ». So come have a taste of the best of what the south of France has to offer, right in the heart of Edinburgh. Have a look at the menu right here. 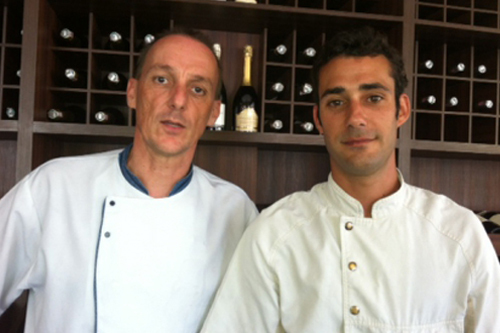 Chef Paul Clark (left) and one of his expertly trained apprentices. In Cumberlaund, Taste’s chef Paul Clark has a first-hand experience of French cuisine, as he earned part of his stripes as an accomplished chef in Lyon, one of France culinary capitals. Now also a teacher, he’s convinced French cuisine offers the best formation to any aspiring chef. For the Goût de France day, Paul Clark plans to put in full motion his mastering of French technics, so don’t miss this opportunity to try an exquisitely prepared Coq au vin, or a delicious navarin of lamb. Discover the full menu here.